guarantee you will have universal compatibility for your phone and other devices. 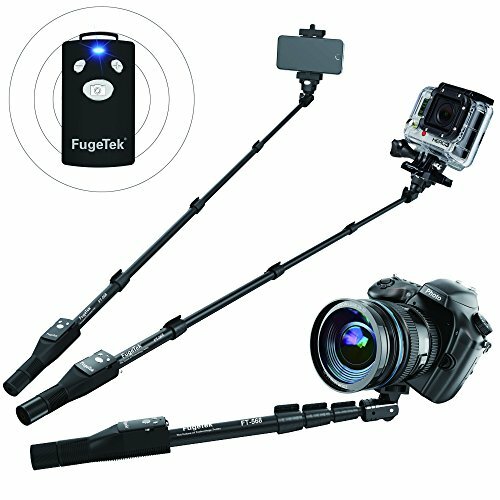 This fully adjustable selfie stick enables a wide array of unique and spectacular photography options. Don't believe us ?? Read The Reviews! This is the latest updated model FG-568 Selfie Stick. WITH MORE ACCESSORIES AND NEW FEATURES ! You Asked For It, We Heard You! NEW - 2 Removable Interchangeable Mounts. One Mirror Mount - No need to look at phone screen. Can use phone's rear HD camera! One Screw Tight Mount - Now you can tighten the mount on your phone and lock it. No slippage or drops! Same great design, more features and accesories for your money! What are you waiting for? Rated #1 Professional Selfie Stick On Amazon! WOBBLE FREE SELFIES, SUPERIOR QUALITY, COMPARED TO LIGHTWEIGHT WOBBLY STICKS > Ultra Extendable To Industry High 49", Hardly Tell It's A Selfie Picture! Quick Flip Locks, Toughest Material, Durable Non-Slip Sure Grip Rubber Handle, Dimension: 16.5x2x2". Weight: 10 oz. FAST CONNECTING BLUETOOTH REMOTE FOR USE WITH MOST PHONES > iPhone, Android, Compatible With Most iPhones (4,5,6,7,8,X) And Android 4.3 Or Newer. (iOS has no zoom feature.) Bluetooth Remote connects faster than the competition, Rechargeable battery, Never Replace Batteries. 300 hour standby, 1 hour full charge. REMOTE DOES NOT WORK WITH GOPRO. AFFORDABLE AWESOME GIFT IDEA > What A Great Surprise To Get a High Quality Professional Selfie Stick. Everyone of all ages can use it and will love it. *Tripod Not Included With Selfie Stick. *GOPRO ADAPTER SOLD SEPARATELY. A NAME YOU CAN TRUST > Why Fugetek? We Take Pride In Our Products And Customers, Friendly Support From Our Houston, TX USA Office, We Offer A Lengthy 18 Month Warranty. If you have any questions about this product by Fugetek, contact us by completing and submitting the form below. If you are looking for a specif part number, please include it with your message.